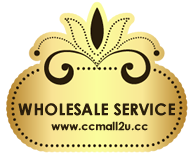 Have intesting to become CCMall2u's Wholesale Member? Register member in website and start order. Minimum purchase RM150.00 every times, all ready stock can mix with Shop Price. Member price = Agent Price. Only need to pay RM30 for one year, no minimum purchase. We can help u post to your customer, no need keep stock. Done payment inform customer service, after adjust your member, can start order. Any inquiry can contact customer service. We have shipping to worldwide. Feel free to contact customer service via whatsapp, viber, line or wechat. ① Minimum purchase RM150.00 above with shop price,not include shipping. ② Continuos cancel 2 times order will straight into blacklist. ③ After submit order we will not accept any change. ④ Parcel will put in together with order list,if don't want put in order list please inform early. ⑤ After payment will send out your goods as fast as possible,normally within 3 days can get your goods. ① After payment and upgrade,we don't accept any refund. ② If have products out of stock,the balance we will save in your user account and don't accept refund. ③ If your order total RM329.50,you had pay RM350.00,balance will save in your user account. You can use the balance to pay your next order.